Undoubtedly, weight loss, a better body and a healthier you are on many of our New Year’s Resolution Lists. It’s a great time to make a new start with positive changes and to begin a new commitment to ourselves. Compliance is always difficult, however, and many of us have issues with this–BUT we do love working with our dogs!! We are often eager to work with our canine companions. Somehow it is easier to take care of our dogs – we pay more attention to their food, their exercise program and their training program. Many of us have the dog’s schedules all set up, but when it comes to ourselves, we are not always that organized and committed. So, what about exercising and working out with your dog? Kill two birds with one stone and increase the compliancy for both of you. Build a bond, have some fun! We have already discussed the importance of core work with our dogs, and it requires a time commitment, but also offers a wonderful opportunity for us to exercise, as well. 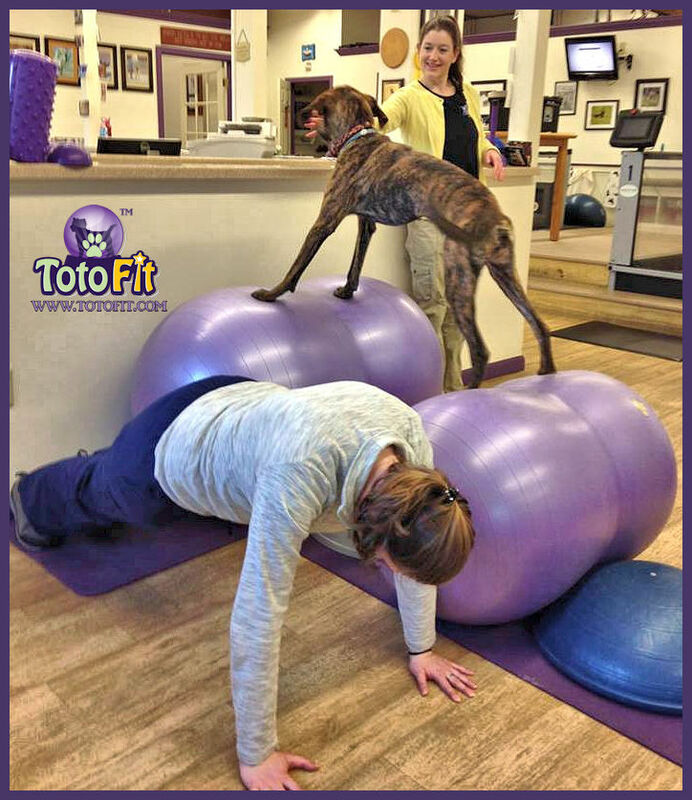 Core work is just as important for us as it is for our dogs! Implementing a fitness program for YOU and YOUR DOG will improve quality of life for both of you. Goals of a leaner, stronger and healthier body are obtainable results for you AND your dog. Strength training is the tool that works the most efficiently. Pete Cerqua, well known author and health fitness revolutionist, created a ninety second workout geared to produce the most optimal benefits that fits perfectly with a human/canine fitness program: We work on our core strength and control while the dog does, too. Benefits of the Ninety-Second Fitness routine include the following: reduction of cholesterol and blood pressure, increase in bone strength since they are weight bearing activities, increase in positive mood and energy, and reduced risk of heart disease, cholesterol and diabetes. Holding a position for up to ninety seconds is the most beneficial way to burn fat and reduce weight. Lean muscle built through strength training boosts the metabolism. We know one pound of lean muscle burns thirty to fifty-five calories just to maintain itself. Therefore, the more muscle we have, the more efficient our bodies will be. Most adults lose between 5 and 7 pounds of muscle per decade, slowing metabolic rate by 5%, resulting in a gain of 15% of fat per decade. So, combating that muscle loss is important in humans. While we do not know specific percentages in dogs, we do know dogs lose muscle with age, as well. Research has demonstrated that holding a contraction for between forty-five and ninety seconds is a highly effective way to build muscle. It also reduces stress on the joints by limiting the number of repetitions required to get results. A contraction “hold” produces more muscle tightness than the traditional three-sets-of-ten per exercise. 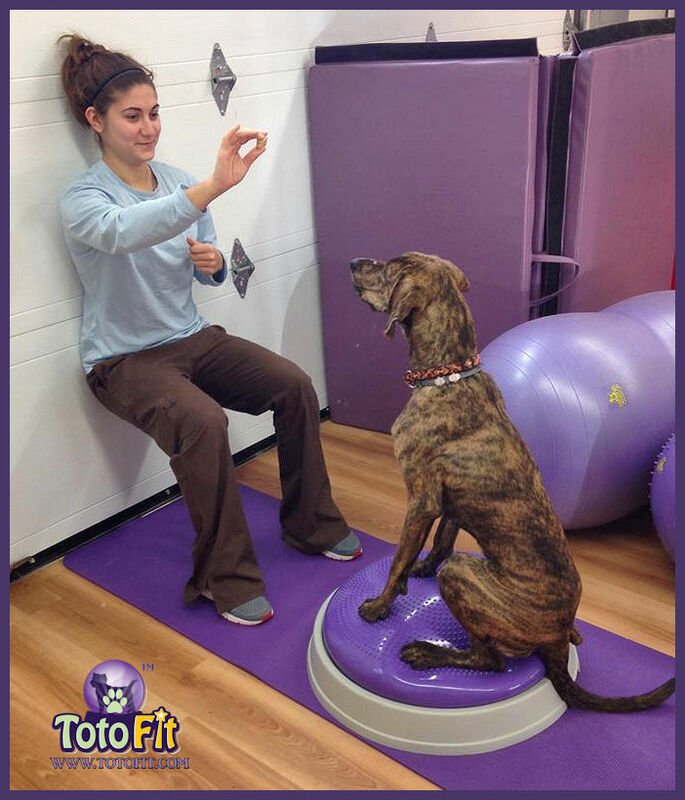 In addition, it is more beneficial for your dog to hold a position along with you than to be in continuous motion. There are a variety of exercises that can be performed as a team. This blog will review two easy exercises to start with. Of course, safety always needs to be the first consideration of any exercise program. I often find myself reminding people not to hold their breath! Dogs breath but humans tend to hold their breath during an exercise! So, that is the first safety step—breath! The second one is to respect pain. If something is painful, do not perform it; do not ask your dog to perform it. And the third one is to make sure you and your dog are cleared for a fitness program by a physician and a veterinarian, respectively. The first exercise is a wall squat for people and a sit on the K-9 Kore Disk for dogs. The wall squat will begin with your hips and knees at a ninety-degree angle. Your hands should be up against a wall, and your back flat against the wall. Your feet should be flat on the floor and your neck and head relaxed. As you hold this position, you will feel not only your legs working, but also your core. This is a great whole body exercise. You may not be able to hold a full ninety seconds to start, but time yourself so you can gauge your progress day-by- day. While you are doing this, your dog should be asked to sit squarely on the K-9 Kore Disk looking directly at you. In the photo, Ashley has one hand up to help guide Savannah, but notice her knees and hips are bent at a proper angle. This should be done once a day, and watch your progress. The second exercise is a plank for you, and a plank for your dog on two K-9 Kore Disks or two Infinities. The plank for you will work your abdominals, arms, chest, back, legs, gluteal area, calves, wrists and the neck region. With the plank, you will raise your body off the floor, straightening your elbows and knees. Your toes and hands will be the only thing on the floor. The goal is to maintain a flat back. And this is a very difficult exercise! Make sure you breath through this and time yourself. Ninety seconds is a great goal! Your dog’s plank consists of placing its forelimbs on one K-9 Disk and its hindlimbs on another K-9 Disk OR front and hind limbs on two Infinities. Your dog should work up to maintaining this position for 90 seconds, as they are able, keeping their topline straight. Each of these exercises should be done once a day. As both you and your dog strengthen, you can progress to additional levels of exercise. Stay tuned for those! But start now with these two safe and simple exercises. Notice how the core muscles engage to straighten the topline and lift the abdomen in these three difficulty levels of dog planking. Beginner dogs should work in a more neutral position, like picture 1, advancing to picture three as they build muscle, balance and time. In addition, do not forget one of the best exercises – walking with your dog. Even a ten-minute walk with your dog can make a big difference for both of you. You can also do a timed mile – time yourself each day on how long it takes to walk a mile. You may find you are better on some days than others. ** You should always consult with a veterinarian before starting any exercise program with your dog.